CARSON CITY, NV – Barben Analytical, a leader in pH/ORP, oxygen and conductivity measurement products, has introduced OXYvisor, its second-generation process oxygen analyzer, which optically measures oxygen in either the gas or liquid phase. In terms of performance, OXYvisor has no equal in the marketplace for trace level ppm O2 gas phase measurements. In the gas phase, the analyzer measures from trace (0.5 ppmv) to % level oxygen, and in the liquid phase, it measures dissolved oxygen from 1 ppb to ppm. The OXYvisor can be used for continuous oxygen measurement for a wide range of industrial process and laboratory applications. 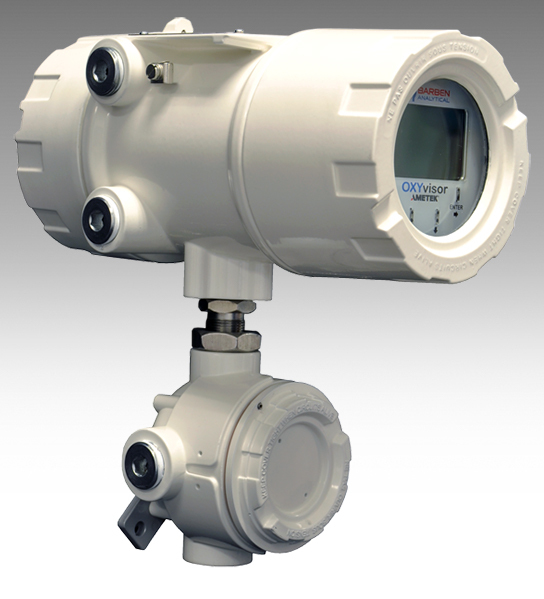 It detects oxygen in flare gas, nitrogen headers, and hydrocarbon and other process streams. It is commonly used to detect oxygen to prevent the corrosion of capital equipment and to ensure product quality. Typical applications include vapor recovery systems, annealing furnaces, produced water, enhanced oil recovery waterfloods, tank blanketing systems, and upstream to midstream natural gas processes. The analyzer uses a proven optical luminescence technique that offers high accuracy, dependability and low maintenance. Its optical technology contains no membranes, which are susceptible to fouling, or electrolyte, which can poison or fail. The unique, industrialized optical oxygen sensing technology is based on proven quenched luminescence measurement principles. The OXYvisor provides supervisory-type monitoring capabilities with advanced diagnostic, auto calibration and remote validation capabilities. This functionality allows users to take significant process actions on alarm conditions at remote locations with high confidence, while significantly reducing maintenance and calibration needs. OXYvisor can be used in conjunction with Barben’s BOSx Series, FiberSense, FlexSense and SafeTap sensors. It has been tested and approved for direct use in Zone 2, Group IIC and Class I, Div 2 Groups A, B, C D hazardous areas. It is NEC- and CEC-certified for North America and has ATEX and IEC global certifications. Barben Analytical is a unit of AMETEK Thermal Process Management, a leading manufacturer of steam heat trace, steam jacketing technology, fluid and gas handling solutions, sample conditioning equipment and process analyzers. AMETEK, Inc. is a leading global manufacturer of electronic instruments and electromechanical devices with annualized sales of more than $4.8 billion.